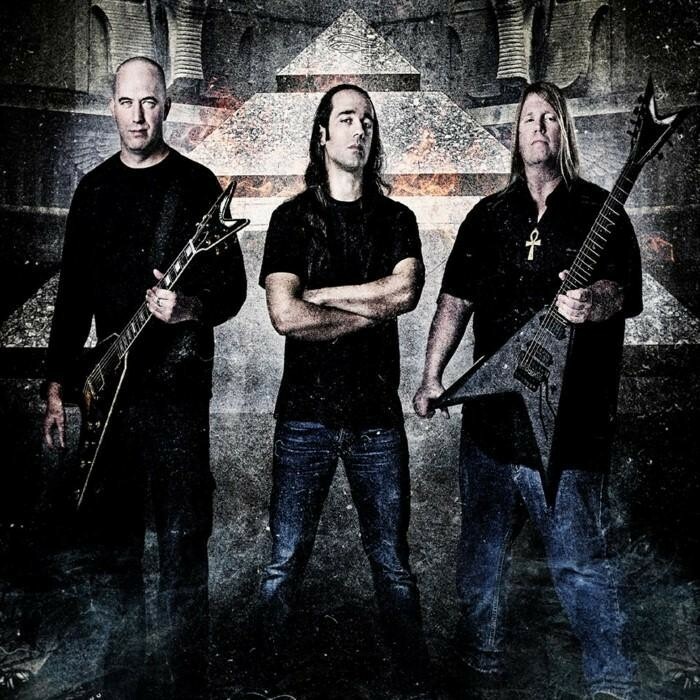 Nile is an American technical death metal band from Greenville, South Carolina, formed in 1993. Their music and lyrics are inspired by Ancient Egyptian/Near Eastern mysticism, history, religion, and art, as well as stories by H. P.
Nile formed in their hometown of Greenville in 1993. With their self-proclaimed trademark of "Ithyphallic metal," Karl Sanders (guitar/vocals), Chief Spires (bass/vocals), and Pete Hammoura (drums) debuted with their Festivals of Atonement EP in 1995, leading Nile to a southwestern tour in support of other big metal acts such as Obituary, Deicide, and Broken Hope. Visceral Productions was responsible for releasing Nile's EP Ramses Bringer of War in 1997, and was going to release their first album Amongst the Catacombs of Nephren-Ka, if they had not gone out of business later that year. However, Relapse Records was open to releasing it in early 1998, giving Nile a wider distribution and a chance to hit the road with Incantation and Morbid Angel. The follow-up, Black Seeds of Vengeance, was released in late 2000. Prior to this release, Pete Hammoura left the band due to injuries sustained while touring for The Catacombs. He tore his rotator cuff and could not recover the use of his arm fully in time to undertake the physical stress of a touring death metal band. He did not want to leave and thought a few more months of rehabilitation could get him up to speed. However, since the band thought he was holding them back, it was agreed that he leave. Derek Roddy drummed on all of the tracks (except â€œTo Dream of Urâ€) as a session musician. Also, prior to Black Seeds of Vengeance, Dallas Toler-Wade joined as a second guitarist/vocalist. A collection of remastered recordings, In the Beginning, was released later the same year. Chief Spires left the bands a few months after the release of Black Seeds of Vengeance citing personal and professional differences. He was replaced by Jon Vesano. The band also found a new drummer in Tony Laureano. By 2002, In Their Darkened Shrines was released. One reviewer noted that the album gave "death metal a cinematic, symphonic twist". Two videos were shot with director Darren Doane, "Sarcophagus" and "Execration Text", respectively. Annihilation of the Wicked was released in 2005. New drummer George Kollias stepped in to replace Tony Laureano, who left before the recording began. After recording the bass for Annihilation of the Wicked, Jon Vesano also left the band. He was temporary replaced by Joe Payne on the following tour. Another Darren Doane directed video was shot for "Sacrifice Unto Sebek". In May 2006, Nile signed a recording contract with Nuclear Blast. On February 26, 2007, Nile entered the studio and began recording their fifth full-length album entitled Ithyphallic, which was their first release with Nuclear Blast. Karl Sanders had confirmed a release date of June 29 via a posting on the band's message board, which was later pushed back to July 20, 2007. As a special bonus, Nuclear Blast gave several fans the opportunity to listen to the new album two weeks before its release if they could decipher a hieroglyphic message, to which "papyrus" was the answer. Upon the album's release, it sold 4,600 copies, which enabled Nile to get onto the Billboard 200 for the first time, reaching No. 162 on that chart. On March 21, 2007, Nile was confirmed as a "Second Stage" act for Ozzfest 2007. A message from Karl Sanders via Nile's MySpace profile indicated that they were excited to finally bring true death metal to an Ozzfest audience. In March/April 2008, Nile went on a US headlining tour with Suicide Silence, The Faceless, Unexpect, and Warbringer. In September/October 2008, Nile set out on a European headlining tour with Grave, Omnium Gatherum and Severe Torture. In October 2008 the band planned to take their Ithyphallic tour to South Africa for a booking of three shows but they were canceled for unknown reasons. In June 2009, Nile entered the recording studio to begin work on their sixth full-length album, entitled Those Whom the Gods Detest. The album was released in November of the same year, and was critically well-received - with one reviewer suggesting "pretty much the only thing standing in Nile’s way at this point is the fact that we as listeners have become so accustomed to the band’s excellence that another excellent album seems almost par for the course". It sold 3,500 copies in its first week of release in America, peaking at No. 160 on the Billboard 200.